The idea of this new activity, not planned in the initial MiRoR project, is to go beyond each ESR’s individual project and involve the whole group in an innovative project, in a common and transversal effort. 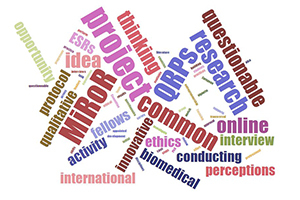 Focusing on questionable research practices (QRPs), we will perform a large international online survey among PhD students in biomedical disciplines across multiple European countries, to investigate their perceptions of and experiences with QRPs. A protocol for qualitative interview was prepared in August 2017 and the fellows are currently conducting interviews, after having obtained ethical approval from the INSERM Ethics Committee. The ESRs are also conducting a literature review which supports the case vignette development to enrich the questionnaire. This activity offers our research fellows the opportunity to enhance their entrepreneurship, professional, team building skills and innovative thinking. The ESRs are supervised by I. Boutron (UPD) and D. Hren (US) but they are very autonomous in this task, and they have appointed Van Nguyen Thu, Ketevan Glonti and David Blanco as project leaders. As the project progresses, initial results and next steps will be made available online.